In the resort town of Skagen you can watch an amazing natural phenomenon. This city is the northernmost point of Denmark, where the Baltic and North Seas meet. The two opposing tides in this place cannot merge because they have different densities. I’m sorry to ruin the fun of this but that’s a lie. Actually, it’s two lies. First, the Baltic sea and the North sea are both salt water, and salt water is miscible. Being miscible has nothing to do with density. Two liquids of different densities can mix. Second, the photo wasn’t taken where it is said it was; it was taken aboard an Alaskan cruise (but I only found this out after searching). So the moment I read that, I knew something was fishy. 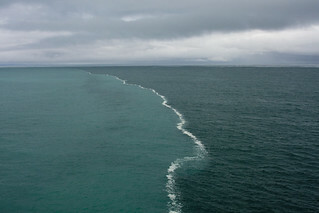 After a minute of Googling for “Baltic and North seas merge hoax”, I found the explanation. I thought I would clarify the image of the Merging Seas, in fact it is my image I posted on Flickr a few years ago and it has gone viral a few times. [Wow! 755,000+ views as of 4/30/12 - Ed.] I call it 'Merging Oceans'. It was taken on a cruise in Alaska in the Alaskan Gulf, not in the North Baltic sea. You can see my original [bigger and better] image here. Also from that link you can see other images I took moments before and after the shot you see here just to prove to people it was my shot and it was in the Alaskan Gulf. So there you go. Learn not to believe everything you are told.